Sie sind hier:UHH > WiSo-Fakultät > Fachbereich Sozialökonomie > Professuren > Mgmt & Dig. Markets > Team > Sven Niederhöfer, M.Sc. 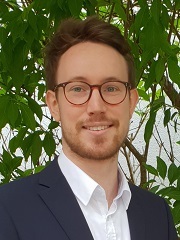 Sven Niederhöfer is a research assistant and doctoral student at the Chair of Management & Digital Markets at University of Hamburg. He studied Information Systems at TU Darmstadt and Tampere University of Technology in Finland with majors in Technology and Innovation Management. Besides his studies he interned with KPMG and Deutsche Bank in the context of digital transformation. His research interests cover innovation management, digital platforms, and digital transformation. Specifically, he is researching aspects related to orchestrating digital platform ecosystems.